To nobody's surprise, the Baker Hughes U.S. rig count was down again for the 19th straight week, dropping 34 rigs to 954. Oil rigs were down 26 to 734, gas rigs were down eight to 217 and miscellaneous rigs were unchanged at three. 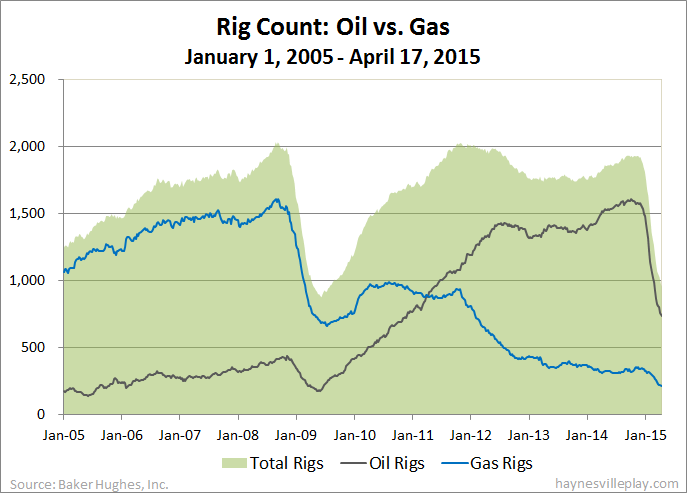 By type, horizontal rigs were down 29 to 741, vertical rigs were down six to 122 and directional rigs were up one to 91. Among gas rigs, horizontal rigs were down five to 175, directional rigs were down one to 33 and vertical rigs were down two to nine.